With election season over and the turkey carved, we can finally turn to Advent. As our minds stumble over gift lists, our hearts beat with hopeful anticipation as body and soul begin preparations for the Christ Child. I know you’ve all felt it before, the magnetic pull to the manger. It terrifies and exhilarates in equal measure, you fight between the urge to rush forward or sink to your knees. Why, why this child? He seems no different than any other; the circumstances of His birth leave much to be desired, then and now. Yet instinctively we know that within His hands lies the whole world, within His veins flows the only cure to our wickedness and pain. He is unique from day one (to use the 2019 March for Life theme). Throughout the world, every culture and people seem to recognize the innocence and value of a child, going to great lengths to protect the youngest among us. Do the eyes of a newborn hold some universal secret? How else do they remind us of simpler, more innocent times, when all opportunities were open to us and our hearts were unburdened by the chains and cares of our human condition? But when does that value diminish and why? We know the redemption offered by the Christ Child is open to all, yet our society turns away from those most in need. How is it a newborn is valued, but eight months previous the child is (often) legally without protection? How do we proclaim Christ came to save all men while we sign death warrants that preclude any possibility of redemption? How can we humble ourselves before the manger and then ignore the homeless and poor around us? Like Scrooge do we claim our taxes are succor enough for the marginalized of our society, that if they cannot help themselves they better get dying. Lord, help to remove the beam from our eyes and use it to prick our hearts. So if you find yourself before the manger this Christmas, let the gospel of peace permeate your soul. 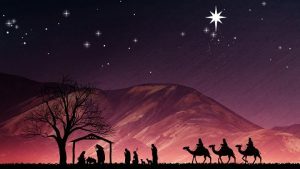 Keep the meaning of Christmas in your heart all year round as you pray and advocate for the marginalized of this world. Continue the great works of charity our Order sponsors, advancing our Pro-Life message with word and deed. Hopefully the fire inside will still be hot January 18th and you will join your fellow Hibernians in Washington DC at the March for Life (9am Breakfast, 12:30 Meet @ 7th Street & Constitution Ave). I look forward to seeing you there and until then may you and yours enjoy a Blessed Christmas.